1. There are no shelters for protecting people from the elements when waiting for trains. Which brings me onto waiting for late trains. 2. Trains are usually late. 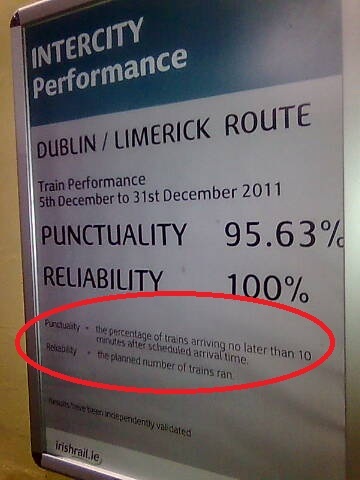 Anyone that uses Irish rail frequently knows that trains rarely arrive on time, in fact Irish rail only consider a train to be late if it arrives more than 10 minutes late, see photograph below. When I recently mentioned to an Irish rail employee that the late train meant I would be late for an appointment, his answer was that I should get an earlier train to allow for any delays, even though the earlier train left an hour earlier! Compare this attitude to Melbourne, Australia where the train operator will give you a refund and a short note explaining to a third party that it was their fault you are late for work, or a meeting, or an appointment etc. Also a late train in Melbourne is one that is three minutes late not ten minutes. When a late train is really on time! 3. There are no clocks and no toilet facilities in the train station. 4. 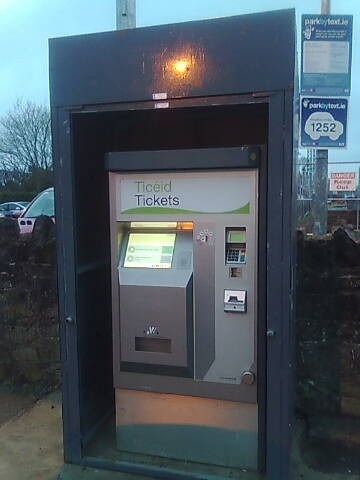 The ticket machine. The ticket desk is only staffed for half the day, until lunchtime I think. When it is closed people have to buy a ticket at the one and only ticket machine, and as it is really slow, big queues of people can develop. Which means you have to allow lots of time in case there is a queue. Even worse it is frequently broken so you cant buy a ticket. Yesterday, the ticket machine was ‘sort of’ working, it wouldn’t except credit cards, or debit cards. Also it would only except the exact change for the ticket. To get around this I tried to purchase a €9.80 ticket by putting in €10, but it rejected my money as it wouldn’t even let me overpay! Returning to the competition that Irish Rail have started. Surely it would be better for people to nominate their favourite station instead of asking people to vote for their own one. The result of the competition would then actually mean something, the way it is structured at present means that the station with the most users will probably get the most votes rather then the best station. However it is worth considering that the bigger train stations are usually better as they have more facilities. To finish, my own opinion is that along with improving their station facilities Irish Rail should concentrate on getting their trains to run on time. 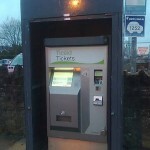 Dear Helpful Engineer, my family had the same problem with the ticketing machine on the weekend in the Sallins/Naas station. It seems that when Irish Rail decided to upgrade this Sallins/Naas station, they just looked at the project and organised the tasks around their own and their contractor’s work schedule. Nowhere in their project plan was a thought given for one of the most affected stakeholders, the travelling passenger. They took away the passenger shelters at the beginning of the Winter Season, maintained the short opening hours of the ticket booth and moved the one ticket machine out into one of the car parks. For those who are new to the station no signage explains the changes or where the ticket machine is now located (an important fact if you arrive on platforms from the side of the station that doesn’t have the machine). I feel (like you) that the station is a barren and desolate building site and the travelling public and their perspectives on the rebuild have been totally ignored. If someone had asked me what would be my input to the station upgrade I would have said install at least two ticket machines (one on each side of the station), put up a temporary shelter and give adequate signage apologizing for the state of the station and outlining where the facilities are. Considering the quantity of people using the Sallins/Naas station on a daily basis this is the least Irish rail could do. Like you, I don’t love my rail station and like a spurned lover I don’t know if I will ever come to find space for her in my heart again! Hi Ronan. Yes I agree with all your points about the construction work at the station. I should have pointed out that works are ongoing at the station at present to erect the new bridge. Its remarkable that more thought was not given to the users when you consider that approx. 1000 paying customers use the station every day. I totally agree with your points above. We used the train last Saturday to go to the Kildare/Tyrone match. I have to say, Irish Rail made an effort to help. There were queues at the ticketing machines, and both cashier desks, but it was mainly due to the lack of space on the platform. When the train arrived, and people moved onto the train, the queues disappeared quickly. I completely agree with you. I remember being on a train once and the guy beside me who was German thought he was on the wrong train because it hadn’t left the station on time. When i told him most Irish Rail trains leave a few minutes late. He said why? I couldn’t answer that one, its a good question.